Dr. Nguyen Thi Minh Phuong from the Ho Chi Minh City Pasteur Institute said the five in one vaccine which will be free given to babies under one year old in the National Expanded Program on Immunization next June is safe as public concern raised about the new supported by the Global Alliance for Vaccines and Immunization (GAVI) Partners Forum. Vietnam has tested reaction after being inoculation of five in one vaccine, valuing it is safe with the low rate of reaction, said Dr. Phuong, adding that the vaccine is manufactured by Berna Biotech Korea Corp and administered in forty nations. 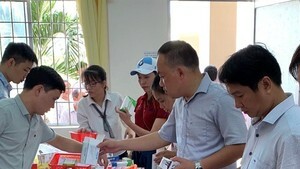 Around 1.5 million dozes of the five in one vaccine against diphtheria, whooping cough, tetanus, hepatitis B and Hib have been imported into Vietnam. The advantage of the new vaccine is that it has a fewer shoots so it will reduce accidents after inoculation. Moreover, it can prevent bacterial meningitis known as Haemophilus influenzae type b ("Hib" for short) and pneumonia. Dr. Phuong also advised parents to delay vaccination when babies are suffering fever or chronic diseases as well as keep staying at hospitals for half an hour after inoculation to examine child’s health. A vaccine is capable of causing serious problems, such as severe allergic reactions. Kids will have fever, redness or swelling or soreness or tenderness where the shot was given; mothers should breast-feed more than usual or more water and make fever compress to reduce body temperature.